Kitty hell is cats living in a house where birds rule. They're off romping through kitty paradise where cats chase birdies, the way things should be for a cat! Life in our home started out as paradise for Tao Tao. A tabby surrendered to the animal shelter by his original owner, Tao Tao arrived in our house first, before any of the birds. Tao Tao originally lived in a one bedroom apartment, and the look of utter amazement when he moved in with us was almost palpable. We had not just one room, but a living room, a kitchen, a couple of bedrooms. Then he discovered the basement with a den, couches, and even more rooms. Could life get any better? Then we got Roxanne, our first bird. The day we brought Roxanne into the house, Tao Tao freaked out! Roxanne freaked out! I had to sit and hold Tao Tao in the living room for two days before he finally figured out that Roxanne wasn't going to eat him alive! Tao Tao eventually got used to Roxanne's presence in the house. She pretty much stayed put on her stand, and Tao Tao stayed out of her way. But then we got Miss Bubba Boy, and life for Tao Tao went to hell in a hand basket! Bubba Boy wouldn't stay put on her stand. Bubba had been raised with a dog, Booker, and Bubba had been in the habit of chasing Booker around the house. So, guess what? This was not good. And then we got even more birds. All Tao Tao wanted to be was a big ole lap kitty, and it was tough being a big ole lap kitty when there were birds around bigger than the cat! Tao Tao often sat on the couch and snarled at the crows out in the yard. Occasionally he would snarl at one of our smaller birds. Tao Tao died at the height of the tainted pet food scandel, and we don't doubt he was probably poisoned by the food he ate. We buried him in front of the picture window with his favorite toys. Ketchikan was forever a feral cat. He was born under the neighbor's back deck and was literally a clone of his mother, Moonbeam. We called mom Moonbeam because for years she was nocturnal, and was never seen during daylight. In the last couple of years however, she's reversed the pattern and comes out during the daytime to eat the food we put out for her on our back porch. She's still completely feral and lives wild, but when you see her out lounging on the adirondack chair in the back yard, she looks like anybody's regular house cat! We trapped her once and had her fixed, so she doesn't produce any more litters of feral cats. Moonbeam's first litter after we moved into our house apparently did not survive. Ketchikan was in the second (and last) litter. Ketchikan had a sibling which also did not survive. 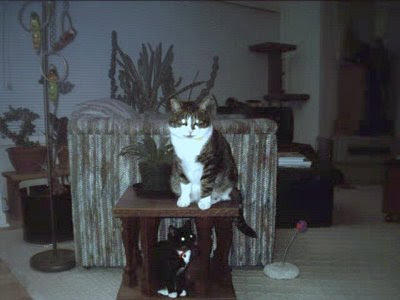 When we captured Moonbeam we also captured Ketchikan, and we kept him in the house. 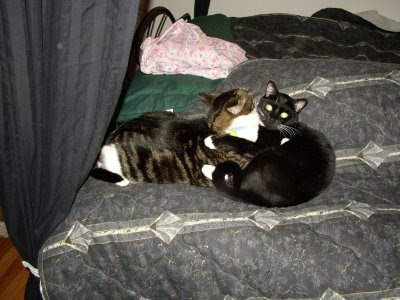 Both Tao Tao and Ketchikan were strictly house cats. Ketchikan immediately bonded to Tao Tao and followed him all around the house. Tao Tao would eat first, and then Ketchikan would eat. Tao Tao would use the litter box, and then Ketchikan. I think it drove Tao Tao crazy sometimes to have a shadow. But if a stranger came into the house, Ketchikan disappeared. And Ketchikan would have nothing to do with us humans. Ketchikan only started sitting on the couch with yours truly after Tao Tao died. He only reluctantly finally started to accept petting. Ketchikan was lost without Tao Tao. More than anything, he probably died of a broken heart. We buried Ketchikan, and his favorite toys, with his old bud Tao Tao, and now they are off in kitty paradise snarling and chasing after birdies, the way things should be for a cat! We miss our kitties, but it just wouldn't be fair to bring another cat into a bird house! And we still have Moonbeam running free outside! The Commercial Parrot Trade Needs To Be Stopped!